Barry Fogel, M.D., FANPA received the 2018 Gary J. Tucker Award for Lifetime Achievement in Neuropsychiatry at the 30thannual meeting of the American Neuropsychiatric Association (ANPA) in Chicago on March 22, 2019. Dr. Fogel is a Professor of Psychiatry at Harvard Medical School where he serves as an associate neurologist and psychiatrist at Brigham and Women’s Hospital and the Dana Farber Cancer Center. He graduated from Princeton University received an M.A. in mathematics from the University of California at Berkeley. He received his M.D. at the University of California at San Francisco. He completed his residency in psychiatry at Stanford University and a neurology residency through the Harvard Longwood Program. Beginning in 1987 Dr. Fogel served as the Associate Director of the Brown University Center for Gerontology and Health Care Research and the Director of Medical Student Education in the Brown Department of Psychiatry and Human Behavior. Since then he has served as a clinician educator at Harvard Medical School. In addition to these academic roles, Dr. Fogel leads a healthcare data analytics firm and a CNS drug development company. In 1987, Dr. Fogel co-founded the American Neuropsychiatric Association with Dr. Randy Schiffer. He is currently a Fellow of the organization and has served as President. He is an editor of 13 medical textbooks and monographs. He is author or co-author of over 135 articles and book chapters on topics in neuropsychiatry and behavioral neurology, medical psychiatry, geriatrics, and health policy. Psychiatric Care of the Medical Patient, published by Oxford University Press and edited by Dr. Fogel and Dr. Donna B. Greenberg, is a classic text concerning the intersection of psychiatry, neurology and general medicine. Its third edition was published in 2015. Dr. Fogel is sole author of four chapters in the book. His next book, Seeing Depression through a Cultural Lens,by Dr. Barry S. Fogel and Dr. Xiaoling Jiang, will be published by Oxford University Press in 2019. Dr. Fogel is a masterful clinician who is highly sought after for consultation. Perhaps his greatest achievement is his generativity and his mentorship for medical students, psychiatry residents and neuropsychiatry fellows. He is a rigorous master clinician. 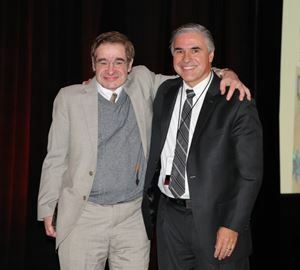 Dr. Fogel has remained active in the American neuropsychiatric Association since it’s inception and continues to provide workshops and symposia, including the scientific program at the 2019 annual meeting.